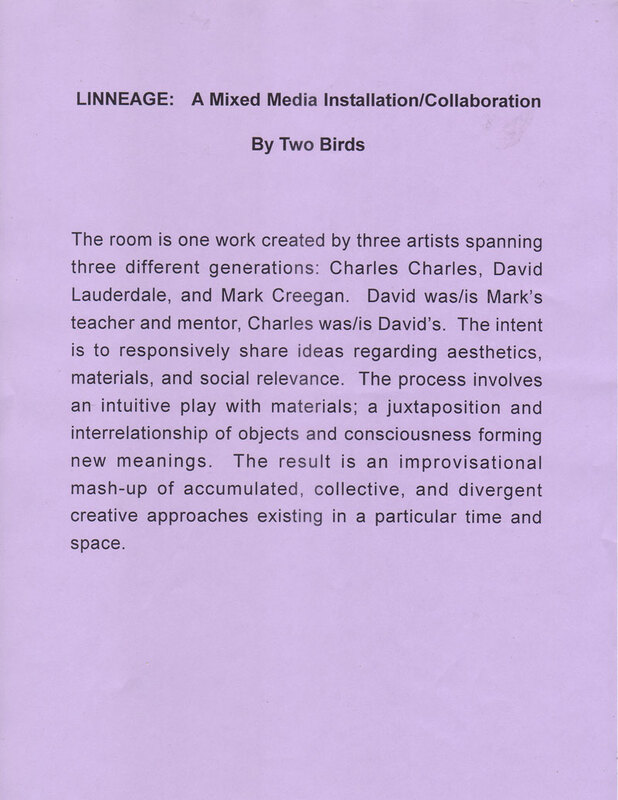 Interview with David Lauderdale and Mark Creegan for their installation “Linneage”. Click above for 84 photos of the installation. 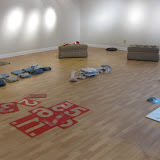 A reenactment of David Lauderdale and Mark Creegan installing the show. Art Laws by "Two Birds"
dialogue. Definitely a great example of the Collective Unconscious at work. I so enjoyed this guys. Thanks for taking the time to meet up and share. I really am proud of how it came together. Well put together. What was clearly an excellent and daring show/piece is well documented here. I do home we see more Two Birds in whatever form the LP and the doll see fit to travel. yo mark, great stuff, all around, this laws thing, really freaking crazy cool and interesting, synchronicity to me is like the play of the universe. i remember reading this spider man comic when i was a kid, where spidey started watching a street football game, where these big kids were just running over this little rag-tag team, humiliating them, and so he decided to go help out the little kids, promising to tie one arm behind his back, so the comic goes through the whole epic game, it’s real exciting, but what nobody knows, what spidey doesn’t know is that the Gods, the ones featured in like Thor comics, i don’t remember their names, like Loki and stuff, these Gods take an interest and watch the entire game, wagering universe sh%t on the game. anyways, this list, i don’t know if any of this makes sense, but the arrival of David’s list makes me think of that story.